Helen Kaminski "Avara" woven fedora hat. Grosgrain bow and hat band. Elastic size adjustable inner band. EXCLUSIVELY AT NEIMAN MARCUS Eugenia Kim "Bunny" sun hat in toyo blend, featuring metallic "Blue Skies Ahead" script. Durable, man-made fibers are woven to resemble straw. Grosgrain hat band at break. Full, round crown. Wide, floppy brim. Paper/polypropylene/polyester. Made in USA of imported material. Eugenia Kim "Lillian" hat in hemp blend. Grosgrain hat hand with raffia pompoms. Crown pinched at center. Thin brim, 2.5"W.
Eugenia Kim "Lillian" hat in hemp blend. Grosgrain hat hand with raffia pompoms. Crown pinched at center. Thin brim, 2.5"W. Approx. 3.75"H x 6"W. Made in USA of imported material. 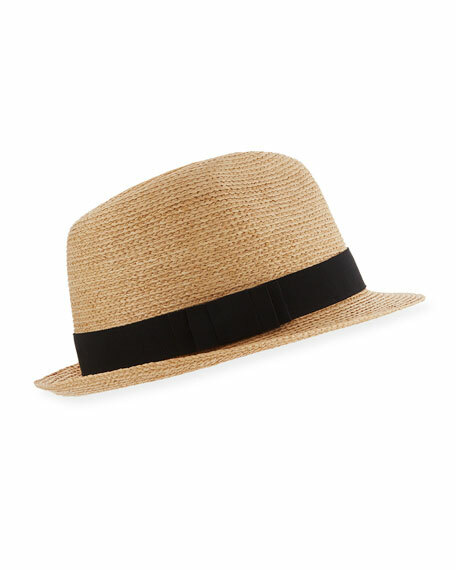 Eugenia Kim "Mirabel" sun hat in natural woven straw. Beaded bird with goose feather tail detail. White suede cord at break. Wide, downturn brim. Tall, flat crown. Adjustable. Made in USA of imported material.